We have decided to make our photo restoration services available to the public. Jeff has been using his computer to restore and re-touch photos for family and friends for years. 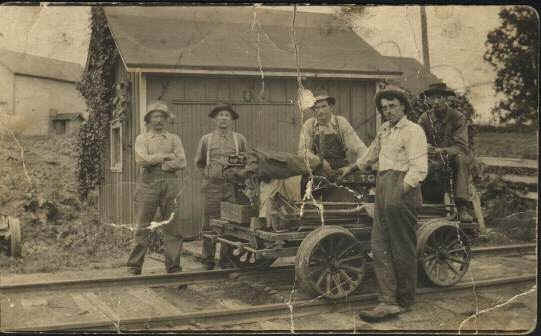 The word has gotten around and requests have been rolling in from other folks that would like some of their family photographs restored. Here are some examples of his work. If you would like further information, email Jeff here. 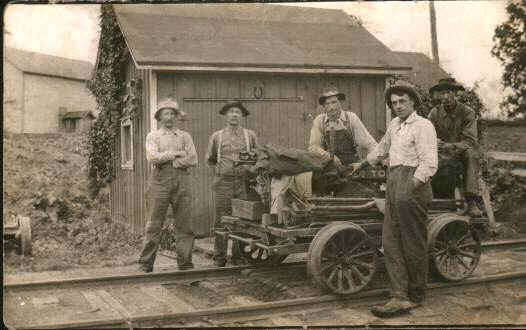 Here is an old photo postcard of one of Connie's ancestors and his railroad repair crew that fell into the wrong hands. (the photo, not the crew) It is ripped, cracked, bent, stained and scribbled upon with pencil. We decided to leave the photo looking old. Just not in such bad condition. These were the results after a few hours of computer magic. We absolutely do color photos as well and have brought back the original color to many faded and discolored color prints too. Let us do the same magic for your family heirlooms and precious memories. We can return you the amazing results in almost any format including printed photos in most any size, even framed if you like or computer photo files on CDR. The possibilities are so vast that it is incredibly difficult to put up a price list. The easiest way is to contact us with your request and we will get back to you with a free estimate.